As a family, you will probably spend most of the time in your car. Running errands, to and from school, and don’t forget all the after-school activities. Here’s a crazy fact– according to National Highway Traffic Safety Administration data,, a child under 13 is involved in a car crash every 33 seconds. We want to make sure you have all the safety tips you’ll need to keep your kids safe while driving. The number one way to keep your child safe in your vehicle is to make sure they are using the correct car seat for their age and weight. Make sure infants remain in a rear-facing car seat until they’re about age 1 and at least 20 to 22 pounds. This positioning better absorbs the force of an impact, making it a better option for small passengers whose necks and spines are still developing. Infants who weigh 20 pounds before 1 year of age should ride in a restraint approved for higher rear-facing weights. Always read your child restraint owner manual for instructions on properly using the restraint. Children over age 1 and at least 20 pounds may ride in a forward-facing car seat with a harness. One critical step for installing the car seat correctly is making sure to secure it with its tether, not just the seat belt. When you secure the tether to the tether anchor in your vehicle, it keeps your car seat from moving forward in a crash, helping protect your child from head and neck injuries. Additionally, always make sure the chest clip is secured across the chest rather than on the belly. The clips tend to move down, so it’s up to caregivers to align it properly. After a child grows out of the forward-facing seat or is over 40 lbs, they can transition to a booster seat. A belt-positioning booster seat, used with the adult lap and shoulder belt, is preferred for children weighing 40 to 80 pounds. Kids should stay in a booster seat until they are big enough to sit properly with the lap and shoulder belt securely buckled. Keep your child in a safety seat with a full harness as long as possible, until he’s at least 40 pounds. Once your child is big enough to ride safely without a car seat or booster seat, keep in mind the back seat is still the safest place. All kids 13 and under should ride in the back, even if they try to convince you that the front seat is where the “cool” kids sit. Check to see that the safety belt holds the seat tightly in place. Put the belt through the correct slot. If your safety seat can be used facing either way, use the correct belt slots for each direction. The safety belt must stay tight when securing the safety seat. 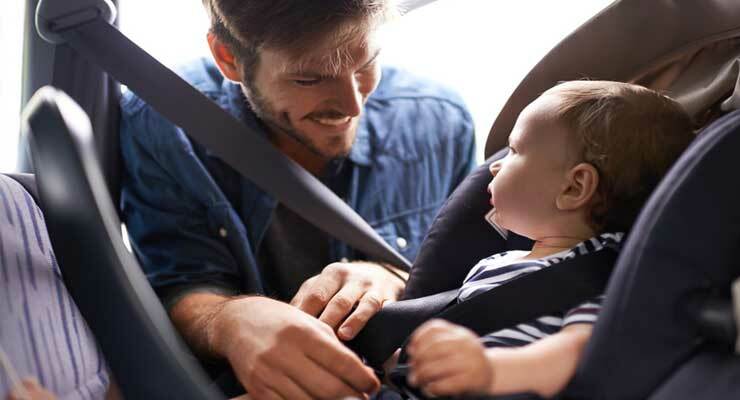 Make sure the harness is buckled snugly around your child. Keep the straps over your child’s shoulder. The harness should be adjusted so you can slip only one finger underneath the straps at your child’s chest. Place the chest clip at armpit level. Check safety belt fit on older children. The child must be tall enough to sit without slouching, with knees bent at the edge of the seat and feet on the floor. The lap belt must fit low and tight across the upper thighs. The shoulder belt should rest over the shoulder and across the chest. Never put the shoulder belt under the child’s arm or behind their back. The adult lap and shoulder belt system alone will not fit most children until they’re at least 4 feet 9 inches tall and weigh about 80 pounds. Hope these tips helped! Is there something about your vehicle that you would like to know more about? Let us know in the comments below.